Glass recycling turns waste glass into a raw material for safe alternative uses; this saves energy, lowers harmful emissions, reduces the need to quarry the raw materials for glass and prevents glass from going to land fill sites. So our unique method of glass recylcing, means you spend less time segregating the glass; if you are a business, this is a direct saving in man-hours and costs; and if your a household, there is no need to handle glass to seperate it, as often it is broken and dangerous. Processed to the consistency of a fine aggregate, recycled glass is a commodity that the construction, agriculture, sports and transport industries (to name but a few) are interested in using. These industries require huge quantities of uniform aggregate that drains well. It needs to be the same size gradation as the natural aggregates they currently use and be free of sharp edges. When waste glass is crushed and pulverized to reduce the size, round the edges, and remove the debris, the resultant glass aggregate will drain nine times faster than comparably sized natural aggregates, and it is easier to handle. 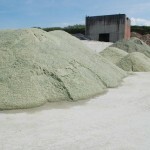 Glass aggregate is strong, clean, safe, and economical. It can be used in unbound (non-composite) aggregate applications. Crushed glass aggregate holds a grade, compacts well, and drains well. Though it doesn’t look or behave exactly the same as regular aggregate, it is a good replacement for conventional gravel or sand. It does not heave in cold weather and does not biodegrade or corrode. It does not leach contaminants into surrounding groundwater, surface water, or topsoil. It has good compaction characteristics providing good workability. Glass recycling has a long track record for providing responsible and cost effective solutions for the reuse of a material that would otherwise take a million years to decompose in a landfill. Glass recycling is also forging ahead, making new tracks with advancements in processing technologies and the development of new applications in the market.